There are control means of graphical window settings. Visibility of coordinate systems and their axes length can be changed on the <Axes parameters> panel. The <Active coordinate system> is drawn on the real space but <Addition axes> of the coordinate system are drawn on left button side of the graphical window. On the <Visualization quality> panel it is possible to assign the default visual quality of objects. Moving the slider in the bottom part of the window will alter the visual accuracy. The higher visualization quality requires more computer resources. The accuracy value will be applied as default for all newly imported objects. Note: It is not recommend to setting high accuracy for lower specification computers due to possible negative effects on speed. The <Use simple OpenGL objects only> option is switched off as default. The option musts be switched on for rare cases only when surfaces can not be drawn right because of the display adapter or its driver does not support full commands list of OpenGL. <Rotation centre> is the point of rotation centre of the graphical window. <Trap size (pix)> is the trap size in pixels for the objects selection and highlighting. <Mouse sensitivity> defines the rotation and scaling speed by mouse. 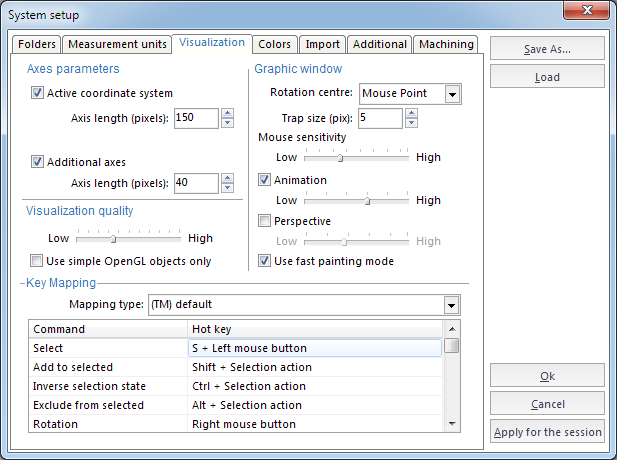 <Animation> assigns count of intermediate pictures when view parameters of the graphical window are instantly changed. <Perspective> defines the objects distortion extent by perspective during visualization. The <Use fast painting mode> option switches initialization modes of OpenGL for the graphical window. If the option switched on then most of display adapters increases the painting speed. However some of drivers of display adapters work unstable for the mode because of incorrectness in realization of some OpenGL commands (unpainted rectangles appear etc.). If the option is switched off then the graphical window works well for all display adapters. <Key Mapping> area defines the hot keys for the visualization control. SprutCAM has four different key mapping schemes. It is created for the convenience of users which works with other systems. On panel it is possible to change yey mapping scheme only. Hot key is read only.